Firefighters working to rescue the driver of the skip lorry. Emergency services were called to Coupar Angus Road following a collision between a skip lorry and a delivery van. A lamppost in the middle of the central reservation was also knocked down in the collision. Emergency services sealed off Coupar Angus Road between Quarryside and Harefield Road for nearly two hours while they dealt with the incident. The skip lorry was blocking the northbound carriageway while the skip was hanging from the trailer of the vehicle. The lorry’s driver was trapped in the cab of his vehicle for over an hour until fire crews and a Scottish Ambulance Trauma team were able to cut him free from the vehicle. Fire crews put up blue tarpaulins while they cut free the driver. He was finally extricated just before 3pm and taken to an awaiting ambulance before being transferred to Ninewells Hospital. It is understood he suffered leg injuries but that his condition is not life threatening. Scottish Fire and Rescue station manager Vincent O’Donnell said rescue teams had worked hard in “challenging circumstances”. Scottish Fire and Rescue sent four appliances and a heavy rescue vehicle to the scene. Station manager O’Donnell said rescue efforts were made more difficult because the incident involved lorries rather than cars. “Anything involving an HGV is more difficult because they are built much more solidly than cars,” he said. Tayside Contracts staff also attended the incident to remove the street light that had been knocked down. He said: “I got hit by a seven and a half tonne lorry last year- it clipped the side of the car. I was just at the doctors because we have a claim in. “And another car ended up on its roof last year. This is the moment an HGV overtakes two cars on a road where a young girl was killed. Dashcam footage shows the moment the lorry speeds past on the wrong side of the Forfar Road in Coupar Angus – which is a 30mph zone. A speedometer on the car’s dashcam shows it was travelling at around 27mph during the incident. The footage was recorded in August but has only recently come to light. It was filmed only a few months before the tragic incident which claimed the life of two-year-old Harlow Edwards on the A94 Forfar Road at the junction with Larghan Park. 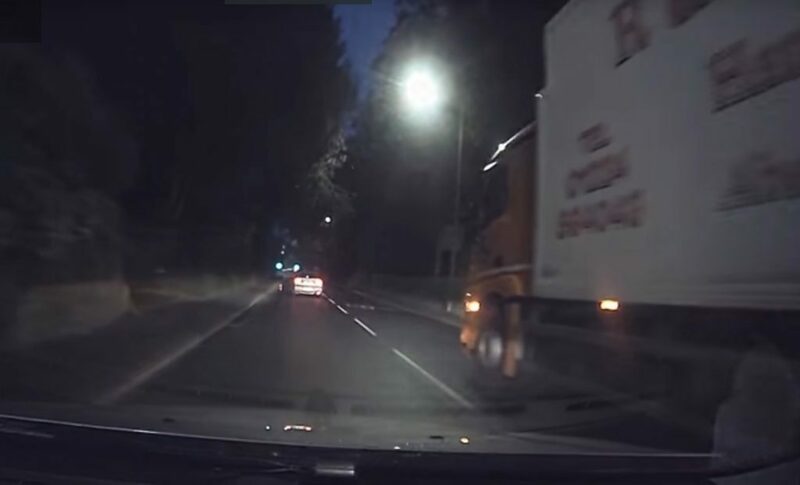 “Shocking” dashcam footage of a lorry overtaking two cars on a stretch of road where a two-year-old girl was killed has emerged online. The R&J Simpson vehicle can be seen hurtling along Forfar Road in Coupar Angus, which is a 30mph zone. The footage was filmed by Perthshire man Robert Hunter as he made his way to work and the camera’s speedometer records his own speed at between 27mph and 30mph during the manoeuvre. Although filmed in August, just weeks before Harlow Edwards was killed when a car mounted a pavement near Larghan Park, Mr Hunter only uploaded the footage to YouTube last week. He said: “There was a car that I was sticking behind that morning as I was on time and always give myself plenty of time to get to work. “I had just come around the roundabout and thought: ‘What the hell is this HGV doing on the wrong side of the road?’ Then I realised that it was to overtake me – even though I was going at the speed limit. For more on this story see Monday’s Courier, also available as a digital edition.